LECTURE 3 FP MAKING PROCESS • Decision-making in foreign policy involves the analysis and assessment of past and current data, in the light of our past experience and that of others, who had dealt with similar situations, in order to identify the need and available options for action in the future and the likely implications of each of those options for the protection and promotion of our national interests. LECTURE 3 FP MAKING PROCESS 3. Determination of policy options - A state must then determine what policy options are available to meet the goal or goals set in light of the political environment. This will involve an assessment of the state's capacity to implement policy options and an assessment of the consequences of each policy option. 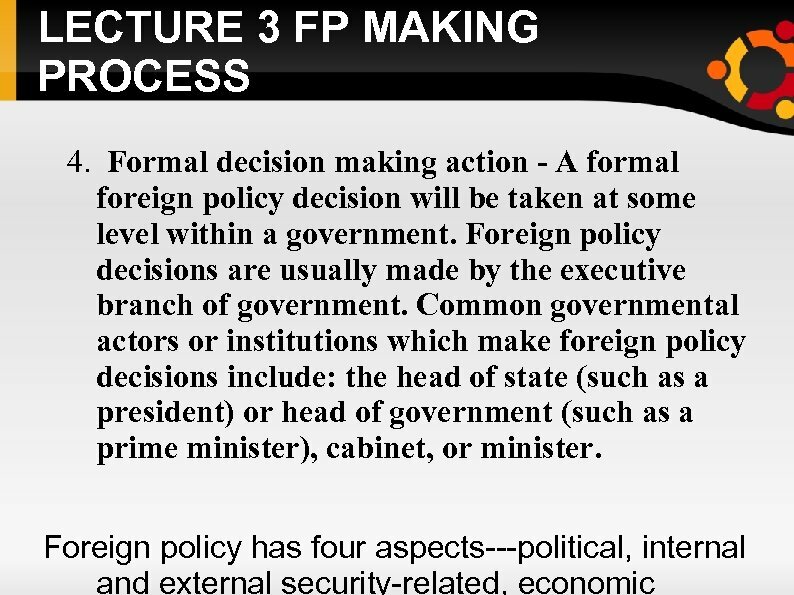 LECTURE 3 FP MAKING PROCESS The process of decision-making in foreign policy has become more complex than in the past due to the following reasons: * The emergence of ethical issues such as human rights, democracy, disarmament etc as important components of the political aspect of foreign policy. * The greater focus on non-political aspects such as economic, environmental etc. LECTURE 3 FP MAKING PROCESS Provided one has a clear idea of one's national interests, meaningful decision-making depends on the following factors: * Effective storage of past facts, experience and assessments and the capability for their rapid retrieval in order to use them for current decisionmaking. * Capability for the collection of current data, open as well as secret. LECTURE 3 FP MAKING PROCESS 5. 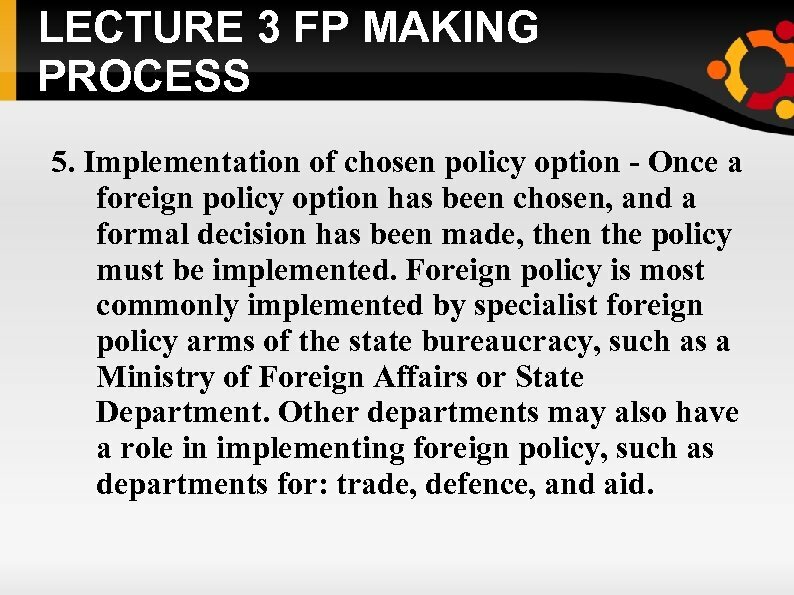 Implementation of chosen policy option - Once a foreign policy option has been chosen, and a formal decision has been made, then the policy must be implemented. 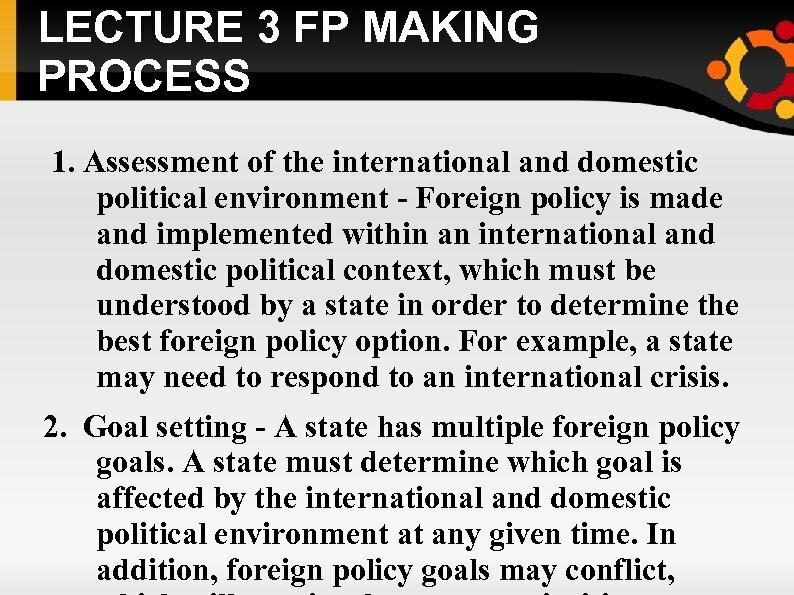 Foreign policy is most commonly implemented by specialist foreign policy arms of the state bureaucracy, such as a Ministry of Foreign Affairs or State Department. 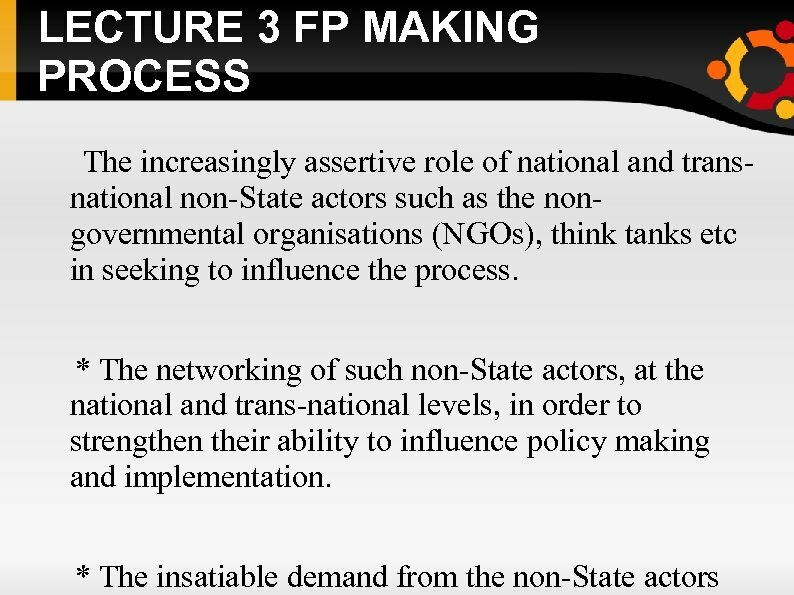 Other departments may also have a role in implementing foreign policy, such as departments for: trade, defence, and aid.